Your job will be a lot easier if you’ve got dark skies. Here at the edge of LA County, M7, the Butterfly Cluster (M6), the Lagoon Nebula (M8), M21, M22, M24, and M25 are all fairly easy to spot with binoculars, and everything else is difficult to impossible. If don’t have dark skies and can’t get to any, at least get as much local darkness as possible. We have a little swath of lawn about 10 feet wide between the house and garage, and if I go back in there the buildings block out about half the sky, but the half they don’t obscure looks a lot darker because I can get all the local light sources (like the neighbors’ annoying security light) out of my eyes. Also, remember that pupil dilation just takes a few minutes, but full physiological dark adaptation takes an hour or so. For my money the best thing in Sagittarius is the M24 star cloud. Go up from the lid of the ‘teapot’ to the first bright star (as indicated by one of the constellation lines in the image above). That star has a little curlique of followers trailing up and to the left. Follow to the curlique to the explosion of stars; that’s M24. It’s not really a cluster in the traditional sense. Rather, it’s a hole in the giant clouds of gas and dust that usually obscure the inner parts of the Milky Way from our view here in the galactic ‘burbs. 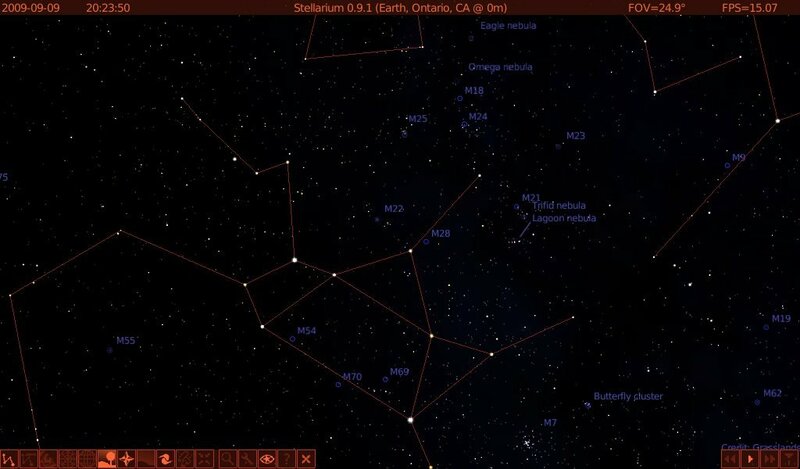 According to Wikipedia, under optimum sky conditions (which I ain’t got) up to 1000 stars are visible through binoculars in M24. I can only see a few dozen, but it’s still pretty awesome. Finally, as always, the view through the binoculars will be a heck of a lot better if you can hold them steady. The best solution here is not to hold them at all, but rather to let a device hold the binos perfectly still while you just look through them. Most binoculars have a 1/4-20 socket at the front in between the objective lenses (this is usually covered by a small plastic cap and a lot of casual bino users don’t even know it’s there). You can use this socket to attach the binoculars to a monopod or tripod. Dedicated binocular tripod adapters are available online for a little as ten bucks, or you can build your own for about two. Get a small angle bracket or corner brace, a 1/4-20 wingnut to attach the bracket to the 1/4-20 bolt of the tripod (this is what you would normally screw the camera onto), and a 1/4-20 thumbscrew to attach the binos to the bracket, with maybe an extra wingnut to tighten things down. BAM! Now you can aim and focus the binoculars, take your hands off and let the shaking settle down, and observe in shake-free comfort. It’s a qualitatively different experience from handheld binocular observing, and you will see more. Hi, just found your blog and am reading with great interest. 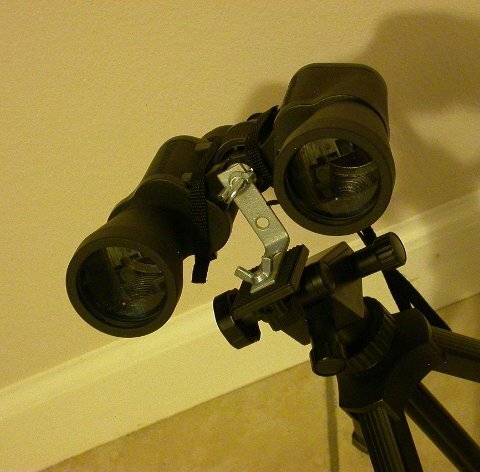 I saw the photo of the DIY binocular mount on the Sept. 9, 2009 post and ran to the hardware store on the way home from work. $8 later I’m in heaven using my 10×50 binocs! Thanks so much for the picture and the great idea. Hi Bob, thanks for the kind words! I’m glad some of my ramblings are proving useful. Clear skies!